Product prices and availability are accurate as of 2019-04-22 18:34:03 UTC and are subject to change. Any price and availability information displayed on http://www.amazon.com/ at the time of purchase will apply to the purchase of this product. This cargo vest was designed with a child's imagination in mind and made for children's adventures. The vest is durable, versatile, fun and easy to use and care for. Made from 100% cotton, this garment is machine washable. 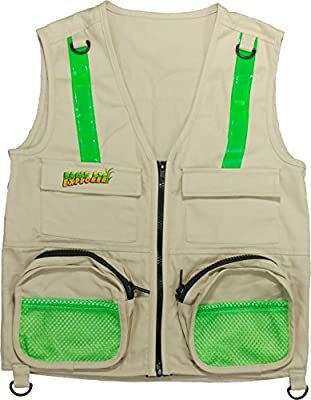 While this cargo vest is rugged and sturdy, it is the safety features that make it perfect for children of all ages. Reflective safety straps on both the front and back improve visibility during outdoor play. This Eagle Eye Explorer cargo vest inspires a child's imagination that can turn ordinary activities into extraordinary adventures! The more children get up, get out and explore, the more motivated they get to do more. Exploration turns the world into a classroom and makes playtime a learning experience.